In a blog post several months ago, I commented on a recently-published study by two researchers at the University of Illinois Energy Biosciences Institute, James S.N. McCubbins and A. Bryan Endres, regarding the length of time the Environmental Protection Agency is taking to review petitions submitted from industry for approval of new fuel pathways under the Renewable Fuel Standard (RFS) (I have described the RFS pathway petition process in an earlier blog post.) The authors’ analysis of data from EPA’s website confirmed what many in the industry have been saying for some time — that EPA has a large backlog of pathway petitions, which may potentially be hindering the growth of the renewable fuels industry. EPA’s Office of Transportation and Air Quality was clearly listening, as shown in an announcement posted on their website earlier this month. Undertaking what EPA calls a “lean government exercise” to improve their internal review process and to make it more transparent. Developing improve guidance for companies seeking to prepare and file petitions, possibly including development of step-by-step instructions and application templates. Trying to “automate” the more routine pathway petitions – those involving previously-approved feedstocks and well-understood production processes, but which (apparently) differed sufficiently from approved pathways as to require submission of a new pathway petition. EPA expects this process to take about 6 months, and they have asked that companies considering the filing of new pathway petitions to consider deferring submittal until after EPA has completed its internal reviews. EPA will continue to review already-submitted petitions during the 6-month period, but will attempt to prioritize their reviews based on the importance of the proposed pathways to the most important goals of the RFS (e.g. 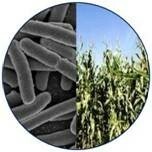 contributing to the cellulosic biofuel mandate), and to the closeness of the pathway to commercialization. EPA is also seeking stakeholder input of ideas for improving the petition process. Any submissions can be sent to support@epamts-support.com, with the phrase “Petition Process Input” in the subject line. I think most industry observers will find this to be a positive development. There is no doubt that there is a substantial backlog of petitions – at this writing, there are 36 pending petitions listed on EPA’s website. Although EPA staff has been encouraging companies to submit petitions as early as possible to get into the queue, no doubt many of these petitions represent pathways that are very close to commercialization, but are requests that have been pending for a long time. This is a state of affairs that could place some companies in a real hardship, to be close to commercialization but to still be uncertain that the process will be approved and therefore qualified to issue RINs. Furthermore, I know from personal experience that there has been a lack of sufficient guidance from the Agency (particularly on its website), telling applicants how best to prepare petitions. In my consultations with Agency staff, I’ve found them to be very helpful, and they’ve indicated that, as long as the most important information, such as mass and energy balances, are submitted, the actual narrative content of the petitions was not that critical. This advice was useful, and it turned out (in my case) not to be too difficult to draft a petition working from the bare-bones requirements of the regulations. However, it is also likely that, due to the vague guidance, EPA found that many petitions lacked the needed information, while others contained a great deal of extraneous information that EPA staff had to wade through to get to the “good stuff”. So, overall, I think this is a positive development, and I look forward to seeing the result of EPA’s hard work during this 6-month period. What’s notable from an economic standpoint is that, for just about all of these crop species, the potential exists to derive additional value from materials that are left over after the harvested crop material has served its purpose in biofuel production. Many of the plants used as carbohydrate sources can be used in animal feed, in the form of distillers grains (often combined with the spent biomass of the yeast or other microorganism used to ferment the sugars); and the protein-rich portion of oilseed crops can also be used in animal feed as oilseed meal after the fatty acids have been extracted for biodiesel production. These are both longstanding uses for such plant-derived materials, which may play a significant role in improving the economics of biofuel production processes by creating byproducts having tangible economic value. The market for dried distillers grains (DDGs) is significant: U.S. production alone is reportedly about 35 million metric tons per year, with a value of somewhere around US $10 billion, depending on the somewhat volatile market price; with over 9 million metric tons of U.S. production exported in 2013. Many companies developing novel microorganisms to produce biofuels by fermentation of these feedstocks are hoping to have their microbial strains approved for inclusion in DDGs that are fed to animals. I hope to devote a future blog entry to discussing the DDG market in more detail, but for today I’d like to discuss the markets for the oilseed crops that can be used for biodiesel production and as a source of seed meal for animal feed. The term biodiesel refers to an automotive fuel that can be used in place of petroleum-derived diesel, which is produced from any of several renewable sources of fats or oils. Although several methods are used, biodiesel is generally produced by chemical transesterification of the fatty acids to produce mono-alkyl esters. In addition to vegetable oils and animal fats, oils extracted from several oilseed crops are commonly used to produce diesel. Historically, these include soybean, canola (rapeseed), palm and sunflower, but other oil-rich seed crops are being developed or have begun being used for biodiesel production, particularly including Camelina and Jatropha. Under the U.S. EPA Renewable Fuel Standard (RFS), there are approved pathways to produce renewable diesel from most of these sources, including soybean, canola, and Camelina, while pathway petitions for use of Jatropha are pending; biodiesel produced according to any approved pathway (at a facility registered with EPA) would be qualified to issue Renewable Identification Numbers (RINs) to take advantage of economic benefits under the RFS. Under the EU Renewable Energy Directive (RED), biodiesel made from these plants would qualify as a “renewable fuel” if the production process met the specified greenhouse gas emission reduction (currently 35%) and satisfied the other sustainability criteria in Article 17 of the Directive. According to a 2012 publication of the Food and Agriculture Organization, there were almost 18 million metric tons (5.34 billion gallons) of biodiesel produced in the world in 2010. This amount is expected to rise dramatically due to incentives and mandates around the world such as the U.S. RFS and the EU RED, and one estimate by the FAO and the Organization for Economic Cooperation and Development is that by 2022 world production will rise to 41 billion liters (approximately 10 billion gallons) per year. The 2012 FAO report (citing an estimate from F.O. 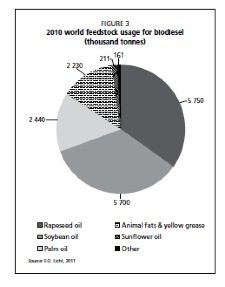 Licht) says that in 2010, most of the biodiesel produced globally was derived from rapeseed oil (5.75 million metric tons), soybean oil (5.70 million MT), and palm oil (2.44 million MT), followed by animal fats (2.23 million MT) (See Figure below, from FAO 2012). Among other sources, 211,000 MT of sunflower oil was used to produce biodiesel, and from these figures it appears that about 12 million MT of oils derived from oilseed crops were used in 2010 to make biodiesel. Based on approximate figures for the percentage of oil in the oilseed mass this amount of oil would have been produced by approximately 68 million MT of oilseed crops. However, this amount of oilseed used for biodiesel production represents only a small percentage of oilseed crops grown around the world. Recent estimates by the USDA Foreign Agriculture Service (downloadable from here) are that the world produces around 500 million metric tons of all oilseed crops combined, with soybean alone accounting for over half this amount with approximately 286 million MT, and rapeseed a distant second at around 70 million MT. Oilseed crops are used for a variety of purposes, including the creation of oilseed meal, a protein-rich material that can be used in human foods and animal feed. The USDA FAS estimated at the end of 2013 that total worldwide oilseed meal production in that year was about 281 million MT, the great majority of which was attributed to soybean (190 million MT). Using these figures and the approximate market prices for oilseed meals at the end of 2013, I’ve estimated that the overall world market for oilseed meal (i.e. the economic value of the 281 MMT of production) was about US $123 billion. Animal feed represents only a portion of the market for oilseed meal. One published estimate (apparently from 2009) was that about 22 MMT of oilseed meal was used in animal feed in Europe, about 68% of which was soybean meal. The European Union represents about 20% of the world market for all compound animal feed, and using this figure to extrapolate, world usage of oilseed meal in animal feed might be approximately 110 MMT. Using approximate percentages attributing this amount of production to the 3 or 4 major crop species, and applying the approximate 2013 commodity prices to the result, gives an estimate that the world market for oilseed meal used in animal feed might be as high as US $50 billion, with about $10 billion in the EU. These are very rough approximations, but they are consistent with other figures I’ve found – for example, from figures published by the U.S. Soybean Board, about 27 MMT of soybean meal was used in the 2011/12 growing season in animal feed in the U.S., giving an estimated U.S. market size for soybean meal in animal feed of US $14 billion, which is consistent with my calculated value for soybean meal used in the EU (15 MMT for a value of US $7.7 billion). These calculations combine published estimates from different sources and different years, and embody a number of assumptions, and so the figure of a $50 billion world market for oilseed meal in animal feed should be considered as an approximation. The market is currently dominated by soybean and canola, and no doubt includes some amount of the oilseed meal derived from crops already used for biodiesel production. But this figure represents a significant market for developers of biodiesel crops – even gaining an 0.1% market share for these byproducts of biodiesel production would represent perhaps US $50 million in annual sales. The animal feed market is segmented in several ways, notably by target animal. According to published data (Alltech’s survey of the amounts of compound feed produced globally in 2012), the overall market breaks down as 44% poultry, 26% ruminants (primarily cattle), 23% pigs, 4% aquaculture, 2% companion animals and 1% horses (Alltech’s more recent survey of 2013 production gives similar results, although poultry’s share has risen and ruminants’ has decreased). Other published estimates provide similar percentages. Different mixes of oilseed meals are preferred for different target animals, and so crop-by-crop percentages within the different sectors differ, but it is clear that the market is dominated by soybean meal, which tends to have a protein content, amino acid balance, and other features that make it well suited for most animal diets. However, each of the other oilseed meals used in animal feed supplement the nutritional value of soybean meal in certain ways, and each type of meal makes up a specific portion of the diet for each target animal species. It is worth noting that most oilseed meal has achieved regulatory approval for use in animal feed. Traditional oilseed meals like soy, cotton, and palm have long been used in animal feed and are considered to be generally recognized as safe (GRAS) in the U.S. and elsewhere in the world. However, because naturally occurring rapeseed contains potentially toxic levels of erucic acid, GRAS status for canola and other artificially-bred low-erucic acid varieties of rapeseed had to be achieved through appropriate testing, with approvals around the world coming in the 1980s. More recently, the oilseed crop Camelina has achieved approval for use in certain animal feeds, in the U.S. and elsewhere, but the potential use of Jatropha meal in feed likely faces the same challenge as did rapeseed, since Jatropha seeds contain high levels of toxic materials such as phorbol esters. Methods to detoxify Jatropha or to breed nontoxic varieties are under development but have yet to gain regulatory approval for use in feed. While the focus of oilseed crop strain development is clearly on improving oil yield or other traits important for diesel production, developers should keep in mind the potential value of the oilseed meal as an animal feed ingredient. For most oilseed meals, markets and marketing channels exist and regulatory approvals to enable market access; while for some of the newer crops some work remains to be done to establish regulatory approvals and gain market entry. However, the animal feed market remains an important opportunity for biofuel feedstock developers to improve the economics of their products.